High quality and made in the U.S.A., this solid turntable runs off a 120 volt outlet and can hold up to 150 pounds. 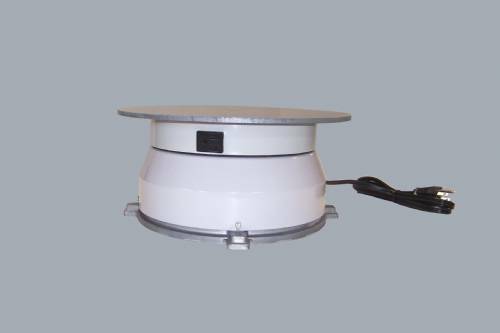 Turntable features a rotating outlet for plugging in a 120 volt item for display. Platform is 17" in diameter and turns clockwise at 2 RPM. Base is black and measures 11 1/2" in diameter. Unit is 5 5/8" high. This turntable features a slip clutch. Available with three additional options: 1 RPM -OR- counterclockwise rotation -OR- 1 RPM with counterclockwise rotation. 4 amp maximum output. Inexpensive and durable, you won't be disappointed with this turntable!